18K White Gold Pave Diamond and Turquoise Pendant. 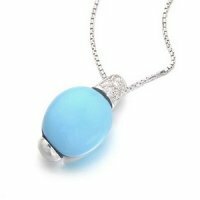 A Graceful Turquoise and Diamond Pendant. This darling pendant is composed of a vibrant Turquoise cabochon encased in stylish 18ct White gold with a dazzling pave diamond top and elegantly suspended from an 18ct White Gold chain. Diamonds 0.05cts approximately. Turquoise 12.9mm x 11.7mm. 18K - 750.